“This is a small project with a big address. It is surrounded by water on three sides, on a 45’ wide lot, on a point of land that was historically a small inshore fishing port. It is a proto-urban project which suggests the making of a village which dialogues with Shobac up the road. Half of the architectural experience is getting there. 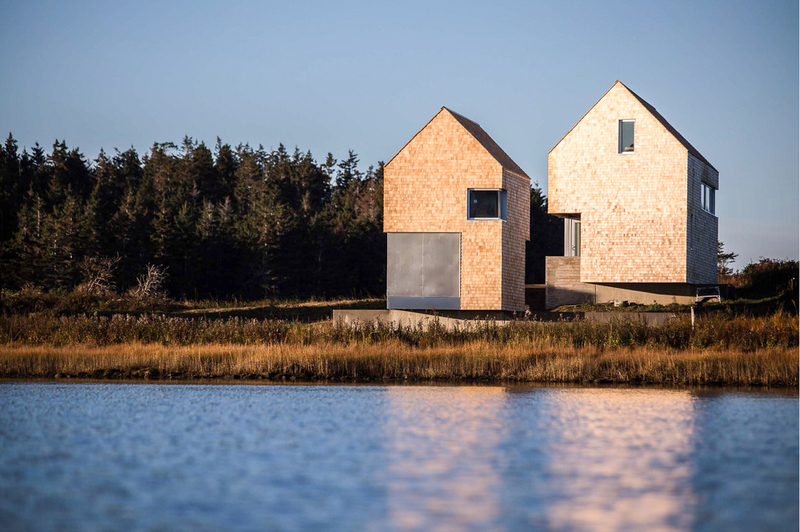 One approaches along a dirt road between two, mute, shingled ‘fish shacks’ (cottage and boathouse). Then right up a pretentious timber stair onto a raised terrace; then right again under an illuminated entry ‘bite’; then past a black kitchen box and into a double height great room; then ones view is drawn out through the south corner window to the sea. 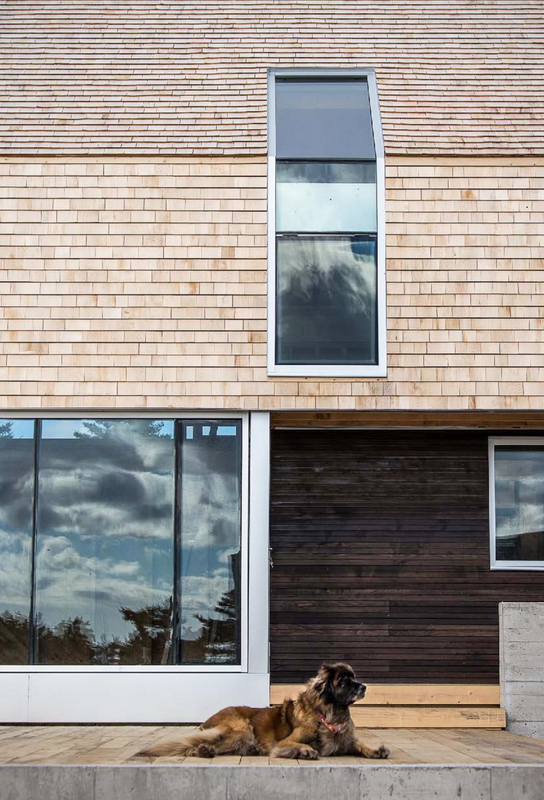 The wood shingles and gabled roof forms present a traditional north face to the public, whereas the more private south face presents a modern curtain wall glass pavilion. The floating, iconic forms are raised on concrete fin-foundations which reach out to embrace courtyards; one for parking and one for sitting out. On the interior, a set of black, steel totemic elements anchor ones experience of dwelling in the landscape: a monumental truss, and a hearth which sits on a 28’ plinth which then becomes a folded steel stair ribbon leading to the sleeping loft.